I began teaching painting lessons at the Ingram Senior Center in Salem, New Hampshire in August, 2009. The class is called “Adventures in Acrylic Paint” and offers the center’s members a chance to work with acrylic paints and explore the possibilities of this medium through examples, hands-on experimentation, and step by step mini-demonstrations of techniques used to get the most from acrylic paint. These lessons are held every Tuesday morning and no prior experience is needed. In the first eight weeks, the class grew to four emerging artists and now is at capacity with six emerging artists and two experienced artists attending. The goal for the emerging artists was to complete a small work within the first few weeks. Their first assignment was to create a basic color chart to get used to the paint and brushes. This was followed by a paint-along, following my example and style of painting with this versatile medium. The first subject was an ear of Indian corn. Once the students completed the corn painting, they could bring in a photograph of the next painting they wanted to try. The experienced artists had an opportunity to bring in a work in progress, or start something new and use a different style of painting with acrylics. I showed all how to use acrylic paints in a manner that encouraged them to experiment and try a different approach using this great medium. I would bring in a different work of mine each week, or a work in progress, and explain how I developed the painting and the methods used to get the various effects. This combination of new and experienced artists worked out well and each artist works at his or her own pace. This has been a terrific adventure for me, and I truly enjoy sharing my experience, successes (and failures) to this eager and willing group. It’s great to see the steady improvement the folks are making. 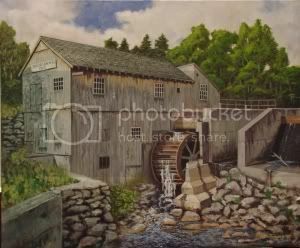 With their kind permission, I have included some photographs of their paintings and will add more as time goes by. We hope you enjoy seeing their good work! As always, your comments are welcome. It is fun to see my paintings on your web. Hopefully, I will finish soon. My bull dog is almost finished also..
Maybe I should finish my bridge painting, now I have a better idea of how the sky should look. the out come. Thanks very much. It’s been awhile since I met you at your impressive art show in Salem, and finally found your card. I remember you telling me you only teach seniors and I’m not there quite yet nor am I getting there fast enough to take your class. Any chance you’ll teach age 53? I work in oils but love your work and would really like to learn acrylics. Yes, I am volunteering at the Salem Senior Center on Tuesday mornings. Currently, I am not teaching an art class in acrylics beyond this. I have been considering holding a six or eight week session of weekly classes in my home in Windham NH. This would be for an experienced artist, like you, who would like to try acrylics, or an acrylic artist that wants to try different approaches with this versatile media. I would focus on canvas preparation, how to get the most from acrylics paints, glazes, washes, and tricks and methods I use to produce various textures, etc. I am using the past year of teaching experience at the senior center to determine what works best to teach and convey the experience I gained over time. I’m teaching mostly non-painters in this class to have some fun with the paint. After all, if the students are having fun and growing in their painting skills, I’ve succeeded. You can check out the students work on my web site under the tab “Student Works”. I have a list of folks interested in such a workshop. I will add you to this list if you like. In any case, the classes would not start until after the first of the year. As I get closer to the reality of these workshops, I will keep you posted. Meanwhile, I will be doing a painting demonstration on Saturday, September 4th at Mann’s Apple Orchard, Methuen MA from 9:00 AM to 1:00 PM. Additionally, I will be doing a canvas preparation demonstration at the Greater Salem Artists Association on Thursday, September 9th from 6;30 TO 8;30 PM as the Salem NH Library. Keep checking the web site for upcoming events under the “Events” page.